Elder daughter's monitor packed in, which opened up a major upgrade opportunity. I have long preferred large CRT monitors for the image stability and the colour fidelity. I use a Samsung 1200NF which is an excellent 21 inch monitor. I have bought quite a few over the last couple of years for work and friends. Unfortunately, they don't seem to be available any longer. The inexorable march of LCD panels has wiped high quality CRT's out of most if not all stores in Singapore. 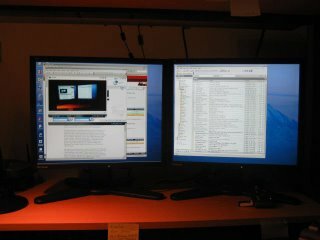 A long held fantasy has been to buy two large panel LCD's and use the Windows XP extended desktop across both simultaneously. It was a matter of seconds to offer up my prized monitor to Elder Daughter, and to plunge into research on LCD's. Few of the models for sale in Singapore seem to be reviewed by the technical web sites. And as usual, the big sellers are low to mid-market as Singapore remains a price driven market. 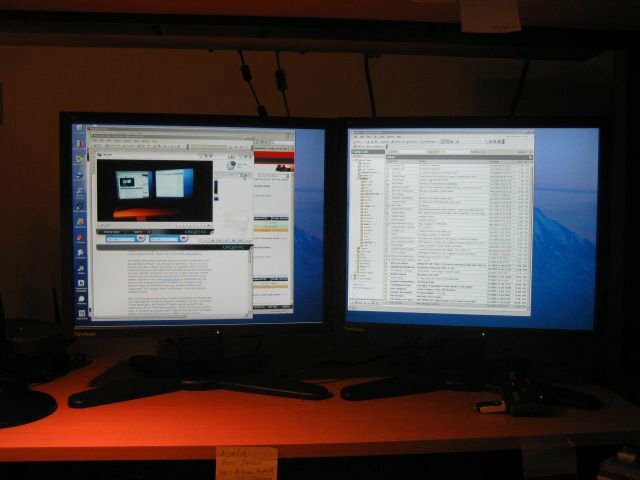 The Dell wide screen monitors reviewed well, until I stumbled on forums with long threads complaining about a high pitched noise emanating from the units. If their is one thing that drives me crazy, it is a high pitched whine - from equipment or collegues... There was also the problem that I would not be able to verify that the screens would be free of pixel defects before paying. With Thursday a holiday for Hari Raya Puasa, I headed off to Sim Lim to see what I could see. I was lucky to run into a sales rep from Viewsonic who was manning a display at Fuwell. I asked to see the best 19 inch panels and she showed me the Viewsonic VP930b. In a highly unusual display of salesmanship, she managed to handle my technical questions, took me to other shops to view the screen when I asked to see text rather than the canned slide show, then arranged to get me internet access to check reviews of the model. Every excuse I had for not buying immediately was handled cheerfully and politely. At which point I ended up with two new Viewsonic VP930b LCD panels. This model is intended for the graphics professional market and comes with extensive software utilities to set colour temperature, resolution, contrast, brightness, sharpness and so on. The native resolution is 1280x1024. The sales girl set up each monitor in the shop, and I checked for dead and stuck pixels on the spot. The final feature that sold me was the stand, which is simply excellent. It allows the monitor to be adjusted vertically, as well as to tilt forward and backwards. The best trick is that you can rotate the monitor to portrait mode for working on long documents. Safely home with my purchases, it was time to set things up. I have an ATI All-in-Wonder 9600XT video card which provides for dual output, so there was no problem connecting the cables. The VP930b has two VGA ports as well as a DVI port, so it will handle any input. Even using VGA, the display is simply beautiful with crisp text and uniform brightness and colour distribution. A quick change to display settings in Windows and I had my dual monitor desktop. KEWL! How has your monitor performed since purchasing it? I am considering the same one and mainly do graphic design work. The panels have proven to be everything I hoped for. I really like the ability to adjust the height easily, which takes the strain out of long working sessions. The colour balance has been excellent, and the software that comes with the units allows precise adjustments. I am completely addicted to having two screens now. I tend to multi-task anyway, so am now able to see a lot more information at one time. Most importantly of all, no dead or stuck pixels. I notice the price has come down as well. Go for it.